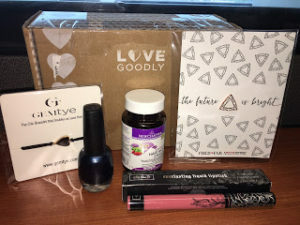 Love goodly is a curated box of vegan, eco friendly and natural products. Check out the unboxing video here. This runs $29.95 every other month so it makes it very affordable subscription box if you don’t want to spend $40 to $100 per month. The box will contain 4-5 items in each box. LoveGoodly also included a Fredandfar trillion pin, retails for $12. This pin is to remind you to love yourself and do things for yourself. Its .75”. Melody Godfed came up with this site as a way to promote self love and self care. As moms, we always put ourselves last, am I right? Baths, meals, snacks, sports practice, concerts, homework, school, house cleaning, bill paying, lunches and so much more. When do we have time for ourselves?! Kat Von D Liquid Lipstick was included as well. It is supposed to last all day. I put it on multiple days when I got dressed in the morning, and then checked thoughout the day. For me personally it lasts through dinner time. Its a gorgeous color. I put some on my hand and then let it wear off throughout the day. I even used a baby wipe, and there was faded color throughout the day. It definitely doesn’t stay as heavy as when you put it on, but for me that’s fine. I don’t necessarily like the harsh line it creates when I put it on so I soften it with powder after it sets. They come in two sizes xs/s fits a wrist of 6.25” -7”. MD/LG fits a wrist size of above 7”. I do love that the hair band is not just a single band of elastic, but its actually doubled up with the way its tied onto the decorative front. Gem Tye This appears to make them stronger and they don’t pull nearly as much as a single hair elastic. Free shipping over $25, however they are found at stores in California. Faby polish is vegan, Cruelty-Free, Big-5 Free (no DBP, Toluene, Formaldehyde, Formaldehyde Resin, or Camphor), no TPHP, no Paraben, no Xylene nail system is designed to provide you with long-lasting, high-shine results. This color is “Save the drive in” which is a beautiful shimmery blue. Hair Skin and nails by New chapter is made with Organic Algae and Aloe. New chapter is a Certified B Corporation, and this product is ICS Certified Organic, Biotin Builds Keratin for Healthy Hair & Strong Nails, Superfood Botanical Blends with Fermented Herbs, Certified Organic by International Certified Services, Non-GMO Project Verified, 100% Vegetarian and Gluten Free .